Like many historians, I’ve long been interested in the way the past is portrayed in pop culture. Now that gaming is a bigger business than ever, there’s an ever-growing field of international scholars studying the way games – digital, board, or otherwise – allow millions of players around the world to play with and within the past. Some of the biggest and most anticipated video game releases of recent years have had historical themes or settings. Some games allow players to create counterfactual historical narratives, as in the Sid Meier’s Civilization series. Others have interacted with real, sometimes divisive historical periods, like Mafia III which allows players to control an African American Vietnam-veteran protagonist in the American south during 1968. A franchise like Assassin’s Creed has long marketed itself on the way it interacts with and depicts historical settings. These are as varied as Victorian London (free-climbing to the top of Big Ben, anyone?) and Medieval Italy (which has inspired an actual walking tour) interweaving fantastical narratives of Templar conspiracy and intrigue into real world events and historical processes. Even older titles like Skyrim (2011) have been remastered for new platforms like the Nintendo Switch and expanding the range of interactions with them, as well as potentially introducing a new generation of players to their historical worlds. Beyond the possibility for granting consumers historical experiences and interaction with heritage locations, as some academics have argued, 1 a close look at certain video games shows us that there’s often significant overlap between the way history has been depicted in cinema and other forms of visual popular culture. The most recent instalment of the Call of Duty franchise (2017) is the fourth in the series set during World War II. When game’s trailer was unveiled at a launch event, actors involved in the game’s production discussed its similarities to Steven Spielberg’s Saving Private Ryan (1998). On the other hand, members of the production team discussed spending time doing real-world research in continental Europe, in the hope of making a game as historically faithful as possible. One of the most anticipated forthcoming titles is a new entry in Rockstar Games’ epic Wild West saga: Red Dead Redemption 2. Inspired as much by the history of the cinematic Western genre as it is about the real history of America’s westward expansion, fans and critics alike often point out how many references to classic westerns they can spot. It’s not just blockbuster video games that are focusing on the past; and it’s not just games about World Wars, individual (usually male) heroes, empires and conquest. Indie games like Never Alone (2014), This War of Mine (2014), and 1979 Revolution: Black Friday (2016), offer more nuanced and emotive access to historical periods and complex political situations usually overlooked in pop culture’s often-repetitive or simplified rendering of history. ‘Walking Simulators’ like (2017) turn the spotlight on to individuals and families, and allow for explorations of their own histories, or the imagined, deeply personal lived experiences in historical places and times. These sites are great places to start for those interested in history professionally or personally, and the way that video games are without a doubt offering players around the world new ways of interacting with the past. Esther Wright is a PhD candidate at the University of Warwick’s History Department. Her research explores the representation of American History in the video games developed and published by Rockstar Games, and the ways in which they are promoted. 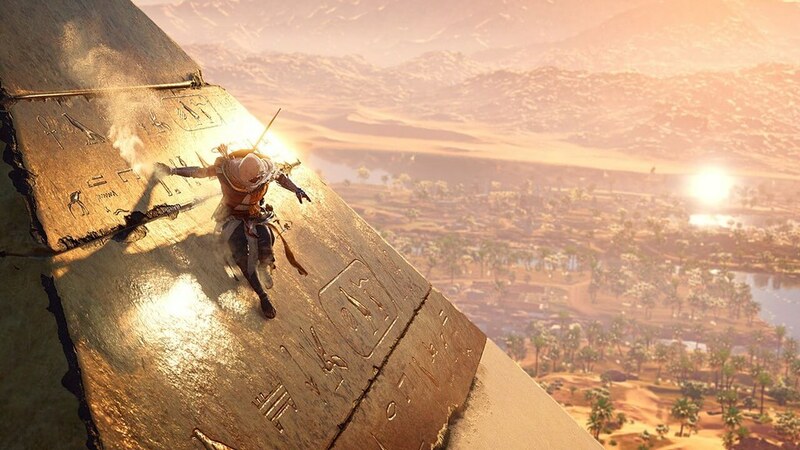 Image: Publicity image for Assassin’s Creed Origins [via Flikr]. When I recite the creed I really try to place verbal emphasis on the phrase “I Believe! For whatever reason, it helps pull me into the creed so that it is less recitation and more of a confession. Its just a trick I pull to engage with the liturgy more and really concentrate on what I am confessing. On a related note, sometimes I kinda wish we would recite the Nicene Creed more often. I get the emphasis on the smaller and easier to remember Apostle”s Creed. I just appreciate the historical and doctrinal significance of the Nicene Creed. Don”t know why I added that. Just came to mind.